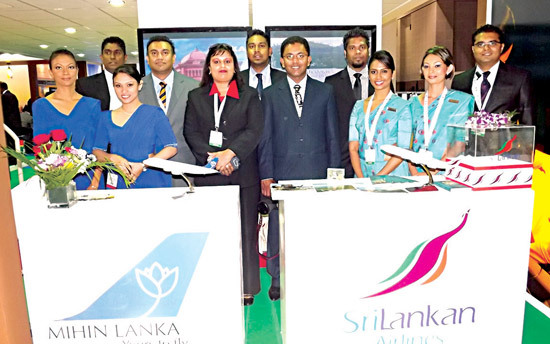 SriLankan and Mihin Lanka airlines would acquire nine additional aircraft to increase its capacity to 30 in the next three years said Chairman SriLankan Airlines, Nishantha Wickramasinghe. Speaking at a press conference at The Arabian Travel Mart he said that currently both airlines have 21 aircraft and this would be made 30 by 2015. He said that they would also add Seoul to the airline radar by the end of this year and would also increase frequencies to India by the end of this year. The rupee will stabilize below Rs 125 against the US dollar as the government has taken serious measures to address the underline imbalance of the economy. Stabilization of the rupee could be seen in the near furniture, Secretary to the Treasury Dr P B Jayasundara said at a press conference held on Monday. “The exchange rate is driven by speculation. However, there is no reason whyit should not stabilize below Rs 125 once the measures taken by the government begins to take effect. With measures such as the adjusting of fuel and electricity prices, imposing of higher import tariffs together with revising the monetary policy twice in the last few months, is expected to bring stability to the economy,” he said. HDFC Bank has taken the lead in publishing integrated annual report givinga holistic picture for the year ended 2011. “This is our first attempt in publishing an integrated annual report that showcases a holistic view of HDFC Banks’ commitment on economic, environment and social aspects of its operations. HDFC depends on stakeholders from employees to community, customers to valued business partners, shareholders to the nation at large,” HDFC Bank Chairman Siromi Wickramasinghe told Daily News Business. India-Sri Lanka bilateral trade has increased by over 65% last year , close to US $5 billion, Indian High Commissioner to Sri Lanka Ashok K Kantha, said. According to Kantha, Indian companies had invested about US $150 million in Sri Lanka last year. He said both countries are witnessing a boom in real estate segment and construction industry, which provides opportunities for enhanced cooperation.